JORN LANDE, the man, the myth, the … legend. Is the missing word rising or fading? 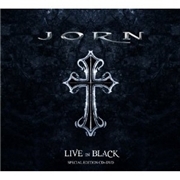 Here JORN is captured live at the Sweden Rock Festival in 2010. Jorn, backed by guitarists Tore Moen and Tor Erik Myre, bass player Nic Angileri and drummer Willy Bendiksen were well enough received and lauded, but what was delivered. I saw the band live at the Zaragon last year, and the track list seems familiar. The bonus material once again contains the much touted “Song for Ronnie James”, as expected as the “Man on the Silver Mountain-infusion” in closing track “War of the World”. But what about the performance and the impression after a few spins? From track one, the changes to the seemingly cemented mid-pace are few. Exactly like the gig I saw. I have friends who basically worship Lande´s excellent vocals, but even they have a limit. The number of ok´s in the info sheet notes is far too many. The difference between JORN and the obvious idol RONNIE JAMES DIO (R.I.P.) is not the physical length, it´s the ability to write songs. Lande fared much better in MASTERPLAN, where that duty was not imposed on him. Back in the eighties Jorn Lande would have been playing every major venue known to man, fronting the band of some guitar magician. In 2011 the money and fame possibilities are limited, and not attached to gloomy mid-paced songs. I believe that JORN needs to revue his backing band too, to find a suitable song-writer with “that little extra”. The extra on offer here comes in the shape of the cover of THIN LIZZY´s “Are You Ready”. But that song-writer can no longer lend a helping hand. In the meantime, alas, the perhaps finest vocalist in the modern world of hard rock is busy running for obliteration, perhaps a career as a cabaret singer or cover artist. What a waste, what a dirge, if my predictions were true.